The 2019 schedule is not yet set. 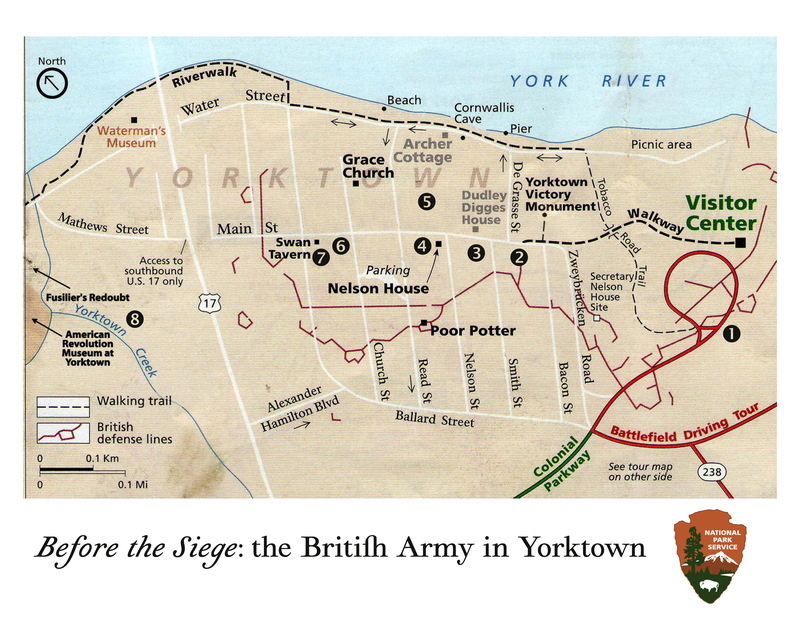 Use this map and brief schedule to help you explore Yorktown as Cornwallis' army prepares for a siege. Most of the actitivites happen along Main Streeet; where at any time you may find soldiers, sailors, and laborers working on a defensive gun emplacement, artificers mending equipment, surgeons caring for the sick, or troops going about their daily business. 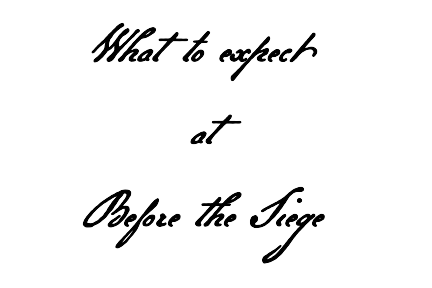 Although there are some set, scheduled acitivities, Before the Siege is planned so that you can explore freely! 9:00 am. Event is open to the public. 4:00 p.m. Event closes for the day. (1)	Visitor's Center. Artillery fire exercise at 12:15, 1:15, 2:15, 3:15. (4)	Corps of Engineers' display, Officer's Mess tent, Officer's Mess kitchen. (5)	Royal Navy camp, military drill and firing demonstration, 11:30, 1:30, and 3:30. (8)	Toward the American Revolution Museum at Yorktown. The Royal Artillery will conduct maintenance on their 3 pounder guns at the camp by the Swan Tavern. Using a portable hoist engine or "gin", the RA will have the capability to hoist barrels off of carriages and pull wheels for repair and greasing the axles. On Saturday, by the Visitor's Center the CNHP Royal Artillery will fire their six pounder at 12:15 p.m., 1:15 p.m., 2:15 p.m. and 3:15 p.m. On Sunday, the participant's three pounder cannon will fire on the same schedule over at the Visitor's Center. Surgeons care for wounded patients and smallpox victims. The Hospital will be inside the Swan Tavern. The Hospital will conduct ongoing interpretation of life in a military field hospital. The Hospital is also equipped for minor medical care. If anyone has a minor injury or is feeling the effects of the heat - go to the Hospital! All morning, “Officer's Servants” will work on preparing a Mess, to be served in the afternoon in a Marquis tent set up at the Nelson House. Meal preparation will begin Saturday morning with a shopping trip to the Yorktown Market Day held on the waterfront green. A soldier's off-duty time was filled with the necessities of life; whether it was cooking rations, cleaning their musket, mending kit, or any of the many chores which required their attention. Most officers were not allowed to quarter in town; they were obliged to camp near their units. The Hornsby House has graciously allowed us to use their front yard to site Officer's Marquis, which will also be the location of the Officer of the Day. He will interpret organizing and arranging military duties as well as assigning responsibilities to the civilians in town. Merchants will interpret the hardships of commerce in a war zone, as well as display and interpret 18th C. trade goods unusual to a 21st Century visitor. They will set up in the yard at 606 Main Street. Refugees were not allowed to sit idle. They would be assigned military tasks, such as the kind of heavy labor involved in building the revetment. They could also try to ingratiate themselves with the military by doing whatever services they could provide; cooking, cleaning, mending, sewing, laundry, chopping wood, hauling water, etc. The refugee area will be the grounds around the 606 Main Street site.